The 2017 Ram 1500 was named Four Wheeler Magazine’s Pickup Truck of the Year, and you only have to experience its performance once to appreciate why. Three available engine options — including the only diesel in its class — deliver work-ready power for heavy-duty towing and carrying, and the entire vehicle, from frame to suspension system, is primed for workhorse performance. If you need to go day-after-day around Rice Lake, Cumberland, or Hayward, you can count on the 2017 Ram 1500 to demonstrate tireless capability. Protects the entire vehicle, including the available RamBox Cargo Management System, with a threat deterrent system at the touch of a key fob button. 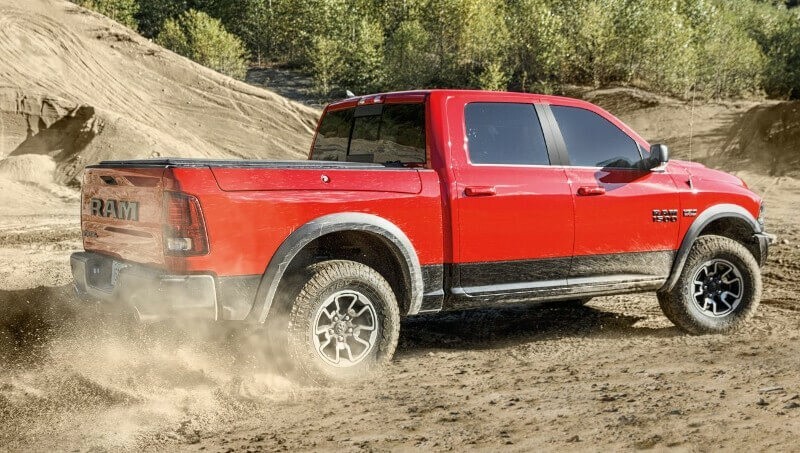 With frame steel strength of 50,000 psi, hydroformed tubular frame unit, and eight tough crossmembers, the new Ram 1500 feels ready for anything. Properly equipped with V8 engine, the 2017 Ram 1500 tows up to 10,640 pounds, placing it near the front of the pack. With V6 engine equipped, maximum payload makes it all the way up to 1,890 pounds. What Goes Into 2017 Ram 1500 Performance? The new Ram 1500 delivers a surprising level of comfort and a stunning array of comfort and convenient features, but you’ll never forget that performance and capability are its guiding principles. If that should ever slip your mind, just put your foot down to experience up to 305 hp from a 3.6L Pentastar V6, 395 hp from a 5.7L HEMI V8, or 240 hp and 420 lb-ft of torque from a 3.0L EcoDiesel engine. The diesel engine makes up to 29 mpg on the highway. Power is refined through a state-of-the-art TorqueFlite eight-speed automatic transmission, so shifts are slick and direct. With a class-exclusive Active-Level Four-Corner Air Suspension offering automatic load leveling and manually adjustable air springs to raise and lower the vehicle to one of five ride height settings, you can expect capability above and beyond even what you’d traditionally expect. As you leverage that impressive towing power, Hill Start Assist and Trailer Sway Control will keep your ride athletically responsive. You can start at dawn and drive till dusk without ever noticing a sign of complaint from the 2017 Ram 1500. To find out more or explore your financing options, all you need to do is contact Don Johnson Motors today or visit one of our dealerships in Hayward, Cumberland, or Rice Lake.